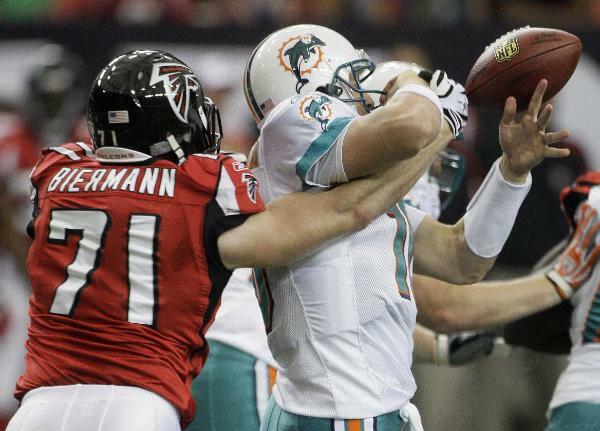 The Falcons defense had a strong performance in a 19-7 win over the Miami Dolphins for a season-opening win at home. The defense was the team’s saving grace as there were some issues early on both offense and special teams. Matt Ryan led the way with 229 yards passing on 22 of 36 completions with 2 touchdown strikes. Michael Turner had a tough day, but managed 65 yards on 22 carries. Tony Gonzalez, Jerious Norwood, and Roddy White each had 5 receptions for 73, 49, and 42 yards respectively. Gonzalez also scored a touchdown. Michael Jenkins had 4 catches for 41 yards, and Ovie Mughelli had 2 catches, 22 yards, and a score. Defensively, they held the Dolphins scoreless until four minutes left in the game. They forced 4 turnovers and got to Chad Pennington 4 times. Curtis Lofton led defenders with 11 stops, and had a forced fumble. Mike Peterson had 7 tackles, 1 interception, and a forced fumble as well. Other noteworthy performances came from John Abraham (3 tackles, 2 sacks), Jonathan Babineaux (2 tackles, 2 fumble recoveries), Kroy Biermann (3 tackles, 2 sacks), Brent Grimes (3 tackles), Stephen Nicholas (6 tackles), and Brian Williams (4 tackles, 1 fumble recovery). On special teams, Jason Elam had a rough outing, missing 2 of his 4 field goal attempts. He connected on attempts of 36 and 50 yards, but missed 42 and 38-yarders. He also missed an extra point. Michael Koenen averaged 38.8 yards on 4 punts, placing 1 inside the 20-yard line. Eric Weems had a kickoff return for 14 yards and averaged 10.3 yards on 3 punt returns. The Falcons will face off next week against their divisional rival Carolina Panthers (0-1) at home. They won their last home matchup against the Panthers last season, but previously had lost their previous three home games. Overall, the Falcons have split their last six matchups against the Panthers, but are 15-7 going back to 1998 against the Panthers.